How was your weekend? Was it eventful? Low-key? Are you frantically trying to finish your holiday shopping? Thankfully I am done with all of my shopping and spent the weekend kind of chilling. Michael had a horrible head cold and spent the weekend on the couch. I ran a bunch of errands (I was OUT of library books and had to get some new ones…I’m totally like a junkie with my books). I did have a great workout on Saturday morning. I’d been avoiding running for about two weeks. I’d run a mile a few times and the most recent time my knee hurt a bit so I back off. Luckily, Saturday’s one mile run was mostly pain-free. I think I have to let my knees warm a bit but once they do, the run always feels great! You know why that number is so high? KETTLE BELLS. If you haven’t given them a try, do so. It’s fun and gets your heart rate up like nothing else. This time I even graduated to a heavier kettle bell. I’m now swinging the 20 pound bell instead of the 15. After the great run and workout, Michael and I met some friends at Nicholas restaurant for lunch and a little mini-Christmas celebration. My friend Star, Sam and her boyfriend joined us. The restaurant on NE Broadway is much better than the one on Grand (much bigger and not as busy). They brought out the piping hot bread that I love so much. It’s similar to pita bread but thinner. I got caught up with my friends and we exchanged cards and gifts. It was time to order lunch and everything sounded so good, it was hard to decide. I love Lebanese food! The flavors are always unique and a lot of the time I struggle to detect what spices they used. The dish I ended up getting was “Freekah.” It was smoked Egyptian rice with ground beef mixed into it, pine nuts, almonds and topped with shredded chicken. The Freekah looked like rice but it’s a unique grain that seemed similar to Israeli couscous. I think the chicken had a hint of cinnamon in it. I’m sorry my photo didn’t turn out better, because the food was really delicious. I especially liked the taziki sauce. I could seriously put that on everything. I had a ton leftover for my lunch (yay!). We spent over two hours hanging out the restaurant and then parted ways. Michael was still feeling a little under the weather so he laid down and I finally go to spend a few hours of my own starting season 2 of “The Closer.” It was a nice relaxing afternoon. 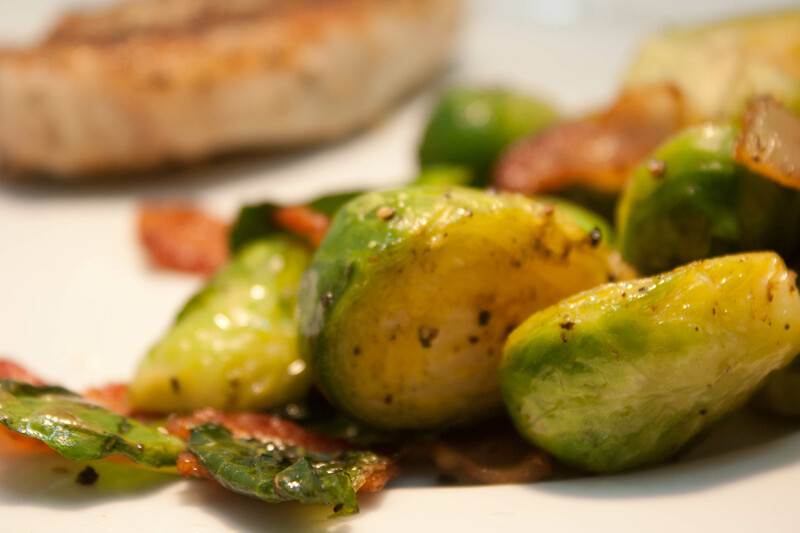 We wanted something light for dinner after eating such a big lunch so we had pork chops and Brussels sprouts. I didn’t like pork for a really long time. It was just a boring protein, I guess. I’m completely converted now. 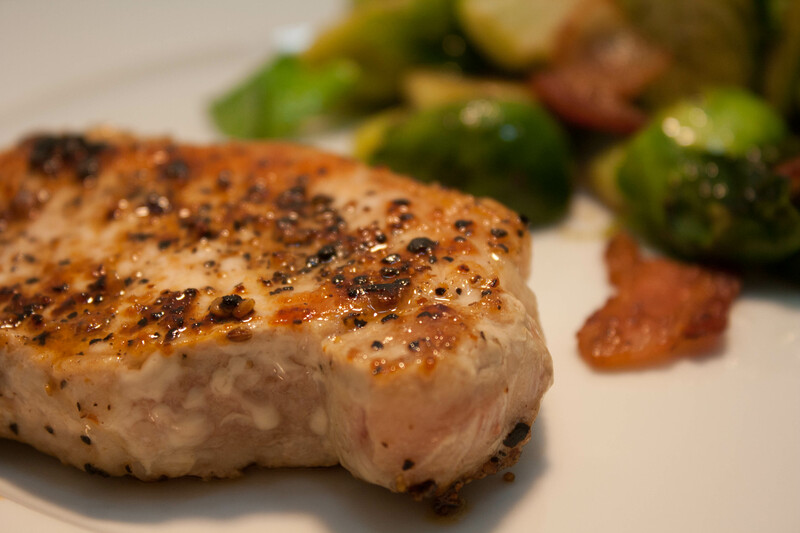 Boneless pork chops are a great dinner option for athletes or someone trying to lose weight. Did you know that 4 oz. of pork tenderloin contains approximately 193 calories and has 33 grams of protein in it? That’s so lean and healthy! A boneless pork chop (4 ounces) can be between 150-180 calories depending on what website tracker you use (I see varying numbers). According to Livestrong that 33 grams of protein in a chop is more than half the typical adult’s daily needs. It’s low in fat and packed with nutrients. Pork chops are relatively lean, not quite as low in fat as fish or a chicken breast, but still leaner than red meat. Another great thing about pork chops–all you really need to season the meat is salt and pepper. Simple, delicious. Pair the pork chops with your favorite vegetable side dish and you have a very, very filling dinner for less than 500 calories. We eat a boneless pork chop for dinner probably once a week. Usually it’s paired with steamed broccoli or sauteed Brussels sprouts. Let me know if you try any of those recipes and like them! QUESTION: Do you like Lebanese food? What’s your favorite thing to order?